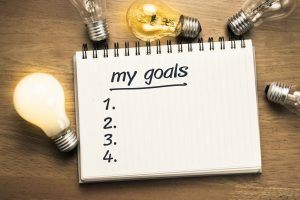 Want To Smash Your Goals? Here’s How To Set Yourself Up for Success. I have! Unfortunately, 92% of people abandon those goals by February every year. I did, and the chances are you have too. This phenomenon isn’t restricted to New Year’s resolutions either, with as many 95% of goals in general thought to end in failure. So why do so many goals go unrealized? Well, achieving a goal is often a long and challenging process. Many people put a lot of thought into what they want to achieve, but they neglect perhaps the most important part — planning how they’ll follow through, particularly when the going gets tough. In this article, I’ll talk you through a proven ten-step strategy for setting — and achieving — any goal. Look out for special bonus tip, too, based on some pretty clever motivational psychology! Which one sounds stronger? “I would like to” is passive and fails to acknowledge your role in your success. “I will”, on the other hand, commits you to action and puts the power squarely in your hands. This creates a positive subconscious shift, and you’ll find your behavior changing in line with your new mindset. The physical act of writing down an intention signals to your unconscious mind that you have begun to take action towards your goal. It also provides visual reinforcement for when you feel your motivation flagging. Write down your goals and intentions, and display them somewhere you can easily see them every day. Understanding your motivation is key to achieving your goals. However, this motivation must come from within. Experts call this intrinsic motivation, and it refers to goals that resonate with fundamental psychological needs, rather than external factors. These can include our need for connection with others, for security, for freedom and autonomy, or to learn and perfect our skills. Let’s imagine your goal is to finish your degree. You know that graduating will get you closer to your dream career, which has great earning potential to boot. Your classmate, on the other hand, is only here because her parents insisted. Who will be more motivated to succeed? You, because you see the real value in achieving your goal. Your motivation comes from your internal desire to a) improve your skills, b) choose a fulfilling career path, and c) achieve financial security. Ask yourself why your goal is so important to you. What intrinsic need will it satisfy? 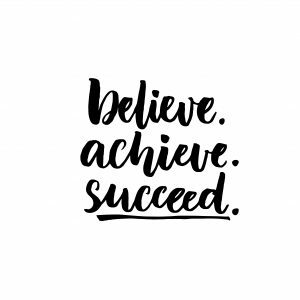 What will it mean to you to succeed? What value will it bring to your life? What do you stand to give up by not pursuing it? You know what you want to achieve, but how will you do it? An action plan provides clarity and direction by listing the individual steps necessary to reach your goal. It also allows you to plan for how you’ll overcome challenges. Think of your action plan as your map, providing you with directions to your destination, and alternative routes for when you meet obstacles in the road. 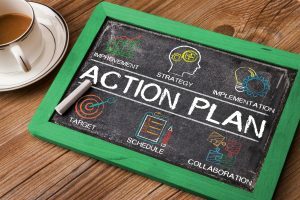 Another advantage to an action plan is that it allows you to break your goal down into smaller, more manageable milestones. This is especially important for larger goals. As you cross off each mini goal, you’ll have a visual representation of your progress, and you’ll be spurred on by seeing yourself edging steadily closer to your ultimate goal. Visualization is a powerful tool for helping you to achieve your goals. It involves creating a vivid mental picture of your future success and what you need to do to get there. Many of the world’s top actors, entrepreneurs and sportspeople credit this technique as a major factor in their success. See my article The Power of Visualization to find out exactly why it’s so effective, and how you can use it to achieve your goals. It’s important to set goals that challenge you, excite you, and even scare you! The bigger your goal, the bigger the reward, and the more likely to you are to put in the work necessary to achieve it. Psychologists agree, saying that people with grand goals work harder, maintain their focus, and persevere when it gets tough. On the other hand, it’s also important to be realistic about what you can achieve. Working towards wealth is a great goal, but you’re not going to go from broke to billionaire overnight. If you place unreasonable expectations on yourself, you set yourself up for frustration, disappointment, and ultimately, failure. Whatever your goal, there’s likely an entire industry around it promising fast, easy results. Trendy diets and ‘get rich quick’ schemes are prime examples of this. However, you know in your heart that there’s no easy path to success. Buying into these quick fixes only leaves you demoralized when you don’t get the results you were promised. Accept that you’re going to encounter obstacles on the path to your goal. You can’t avoid them, but you can conquer them with the right preparation. Brainstorm the challenges you might face and come up with an ‘if/then’ plan to tackle them. When the moment comes, you’ll know exactly what to do to stay on track. You’ve got this! To stay on track, especially during tougher times, it’s important to build accountability into any goal plan. If you’re slacking off or losing motivation, are you disciplined enough to have tough talks with yourself? Or do you let yourself off the hook too easily? We hate to be seen as going back on our word, so accountability is usually most effective coming from other people. It can be as simple as sharing your goals with your friends and family, hiring a trainer, finding a mentor, or attending a group of likeminded people working towards a similar goal. A friend of mine, an entrepreneur, has what he calls an ‘accountability partner’. When one of them has a big goal to reach, he pledges an uncomfortable amount money to the other. If he fails to reach his goal in the agreed timeframe, the other gets to keep the money. Neither have missed a goal yet! Research shows that those who self-monitor are much more likely to reach their goals. When setting your goal, identify a few key indicators that you’ll measure at regular intervals. For example, if your goal is financial, you might measure savings, investment performance or commission. If your goal relates to fitness, you might measure body weight, running distance or muscle mass. You’ll be able to clearly see if you’re making progress. If not, you can tweak your action plan, weed out any failing strategies, and get back on track. BONUS TIP: Prime your mind. 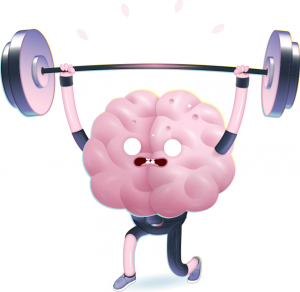 The brain is hardwired to pursue goals, and this activity is often triggered in response to environmental cues - sights, smells, items, or noises, for example. In fact, it’s thought that as much as 80% of your daily behaviors are in response to these cues, most of which you’re not even consciously aware. So how can you use this knowledge to reach your goals? Trying to lose weight? Keep healthy foods visible on your counter or desk, pin up motivational images, and leave your workout gear where you can see it. Place fitness books or magazines in visible spots around the house, keep your healthy meal plan on the fridge, and drive past the gym on your way to work. You can even get an inspirational slogan printed on your coffee mug and change your computer passwords to handy reminders. On the contrary, be sure to remove any negative triggers from your environment. For weight loss, this might mean keeping snack foods out of sight and changing your route to avoid your favorite fast food place, for example. Ready to take action? Start setting powerful goals now. So now you know the ten steps for setting powerful goals, it’s time to put them into action! I’m offering a $1 Trial to help you define your goals and create an unstoppable action plan for success. If you’re ready to see exactly what you’re capable of, book your $1 trial now by clicking the button below.